In just 4 short months since our last visit, it seems “Bae’s” (chef Oona Tempest) demeanor changed quite a bit. She’s got much more of the “chef air”, or at least, her master, Chef Toshio’s air. Take a read of my TANOSHI post, Toshio-san’s a bit “uppity”. It could have just been a bad day, but she was not nearly as friendly, as willing to discuss sushi knowledge as she last were. It started with Bae just being distracted, unengaged. Asked her a few questions here and there, she responded, but was brief, illusive. As the night went on, it got worse. Bae blatantly snubbed my Kitty Kat’s questions a few times. Kitty Kat wasn’t even asking in depth questions, just what she was being served, as she was sitting a little further, and couldn’t hear. Then Bae’s friend showed up, and it was as if we weren’t there, complete neglect. Final example of Bae’s demeanor change… Sushi By Bae is supposed to be more traditional Japanese fishes and serving styles. Sushi By Bou is the place to go for STAPLEs. You’re not going to get much Japanese fish, or anything exotic or rare, ever. 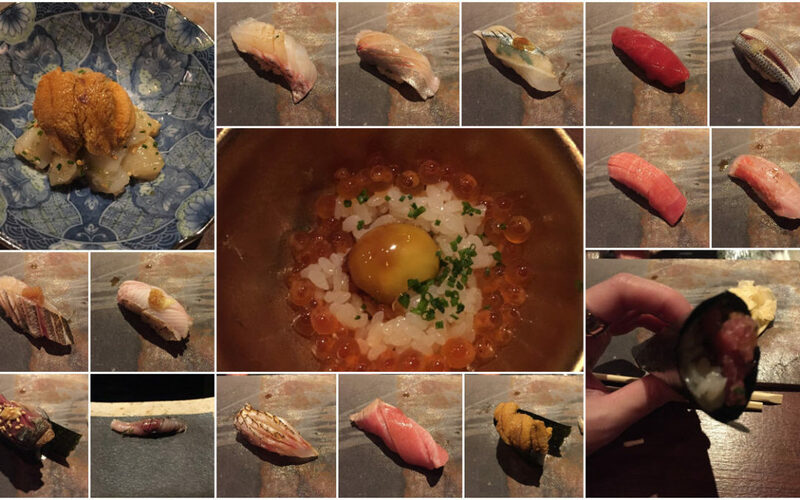 But their staples, BOTAN EBI, California UNI, WAGYU, and combos thereof, are fantastic. At the end of our meal, after having purchased 3 omakases, 3 add on pieces each, 3 bottles of premium sake, we asked for a final piece of WAGYU steak raw, topped with UNI. Her response was, that’s Bou, we’re Bae, we don’t have that. Now come on!!!! The steak is inches away from you, the service staff is shared, and the billing system is the same. What the heck kind of service is that? If it’s truly an issue, offer to start a separate tab for us for that one piece. Clearly, that would have been much too logical. The curt, “ain’t me” kind of response was more Bae’s style that night. Seriously – in this day and age, how is that kind of customer service acceptable? I feel like I’ve gone on a bit of a rampage of complaints, and it’s true, I have very little tolerance for rudeness, especially at restaurants we frequent. 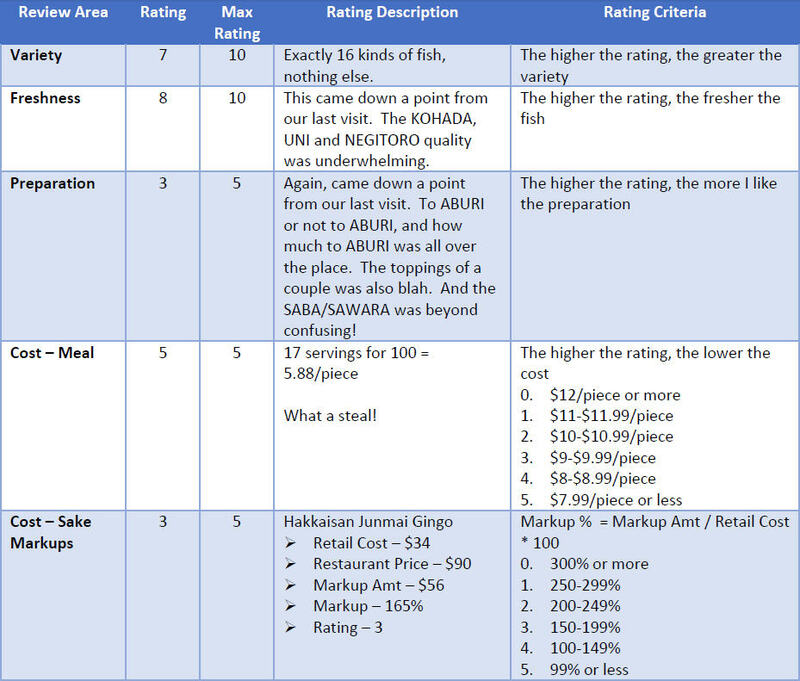 In the span of 2 months, we visited Sushi By Bou and Sushi By Bae five times. I’d call that being “regulars”, wouldn’t you? I also consider ourselves as “great” customers. We’re incredibly nice, incredibly polite, and we share our bottles with others. In short, we bring the fun without the rambunctiousness. Oh, and we tip. I looked back at the receipt, boyfriend did 38.11% for this meal. I’d say that’s pretty generous. Shouldn’t our generosity be rewarded? We typically hang around post dinner, and have more drinks with Josh, the host, and the bartender of the evening. Tonight, we decided to drink downstairs at the Jue Lan Club instead. Hint hint – your chef was rude! Not very subtle, am I? Ha! Subtlety is not a virtue I possess. All that said, if you don’t care about how you’re treated, and want to pay a “fair” cost for respectable, but not stellar sushi, Sushi By Bae is still a very solid option. 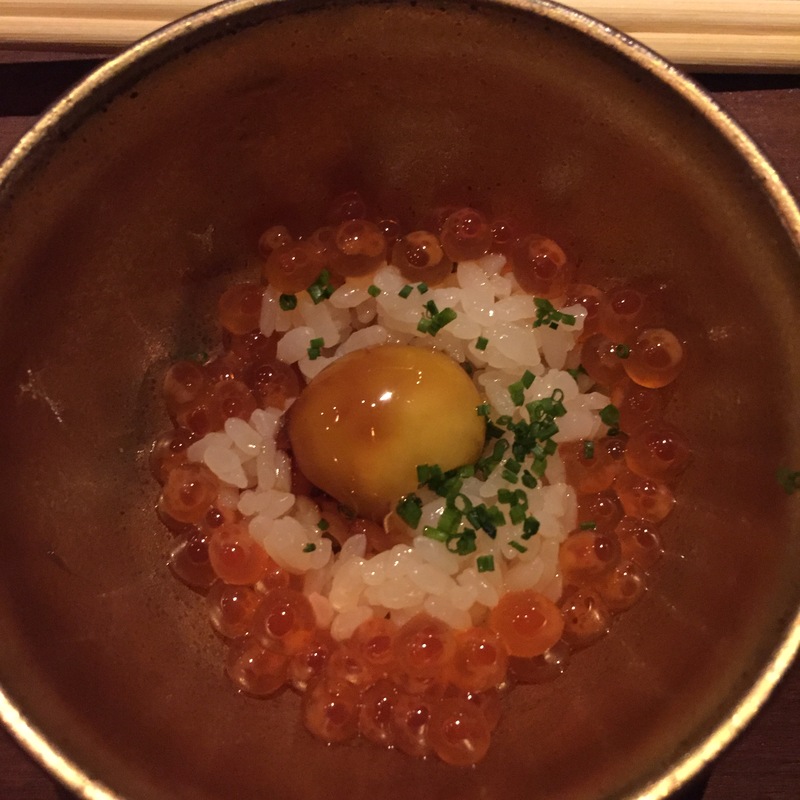 HOTATE topped with Maine UNI and Wasabi TOBIKO – Same verdict as our last visit, too much citrus. Overwhelms the fish. MADAI KOBUJIME (seabream marinated in KOMBU – a kelp) – This one was GREAT. Nicely marinated, but still maintaining the crisp natural tastes of the MADAI. Delish! 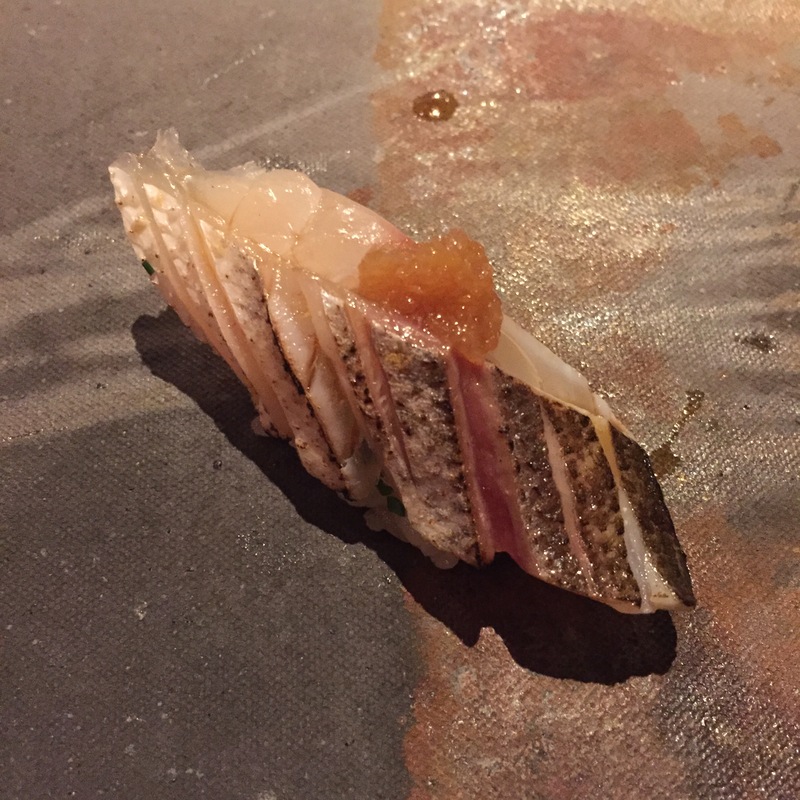 SHIMA AJI (Striped Jack) – During our last visit, I dubbed Bae’s SHIMA AJI as the “SHIMA AJI wonder”. Bae layers chopped chives between the rice and the fish, rendering a unique nuttiness, that truly compliments the serving. Very different, in a good way. 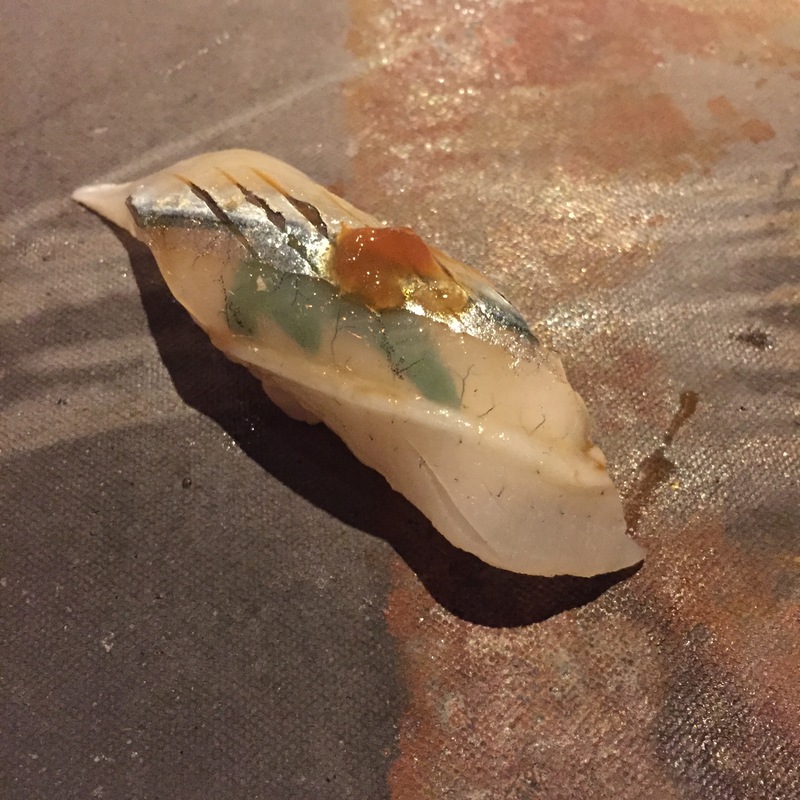 SAYORI (Needle fish) – Served with a small piece of SHISHO between, and topped with a plum sauce. The quality of the SAYORI was fantastic, but the pairing was not good. Not a fan of the plum sauce on the SAYORI. 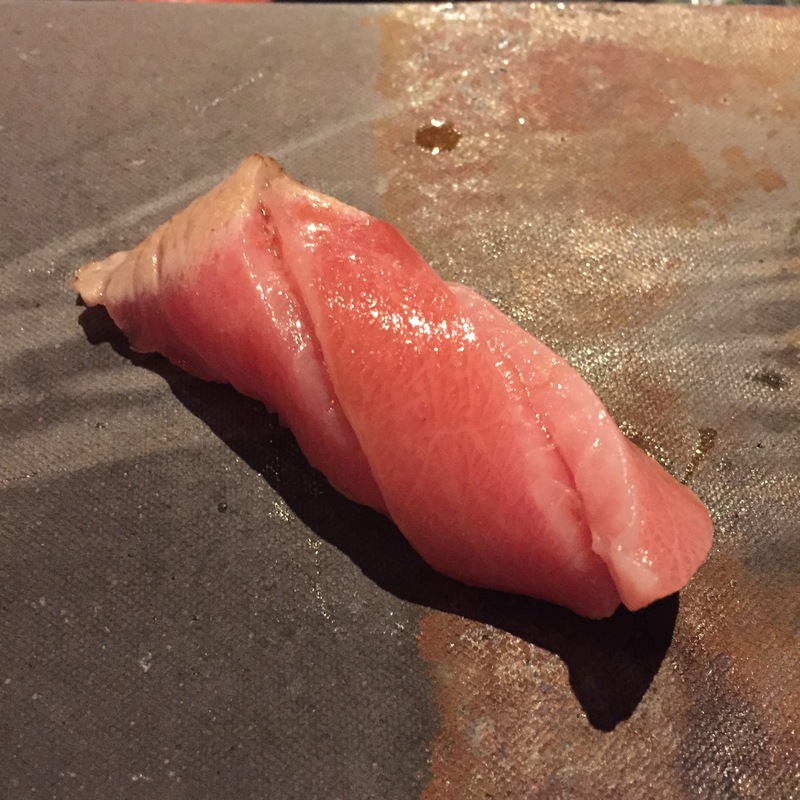 AKAMI ZUKE (lean Bluefin tuna) – This was a very lightly marinated AKAMI. Very happy with the fish and the serving! 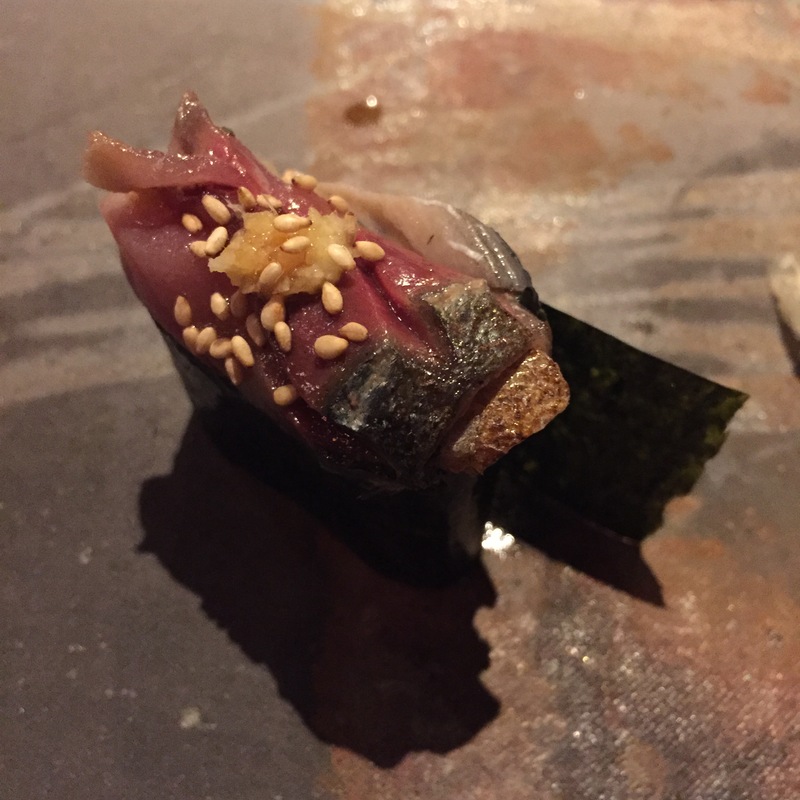 KOHADA (Gizzard shad) – Served with sea grapes. Looks beautiful, but the KOHADA was just ok, a little too fishy for my taste. 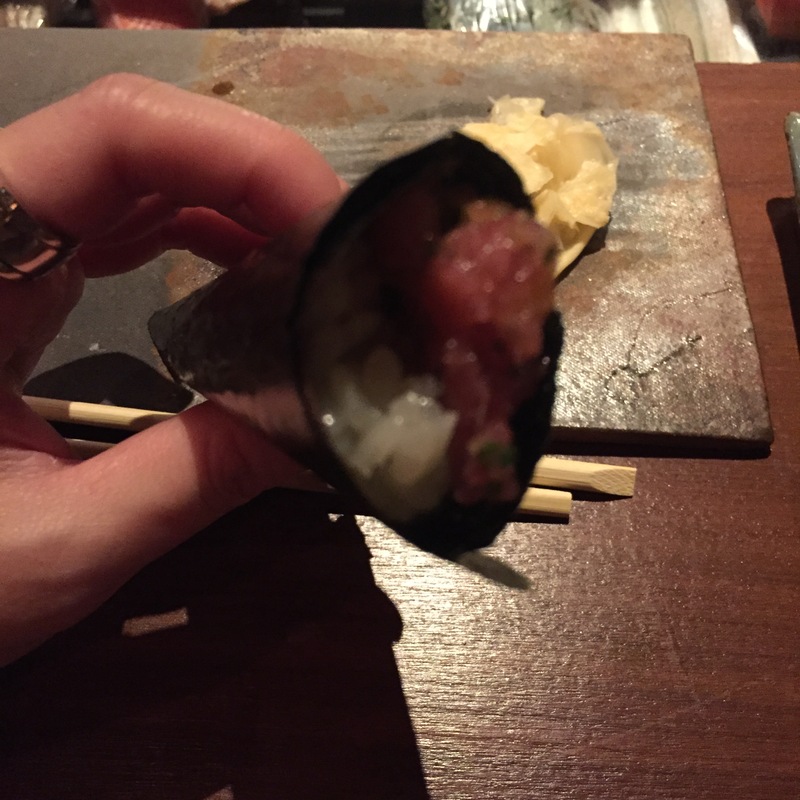 CHUTORO (Medium fatty tuna) – Improvement from our last meal with Bae! Just like last time, great flavor, and no funky aftertaste, but this time, no veins! This cut melted! 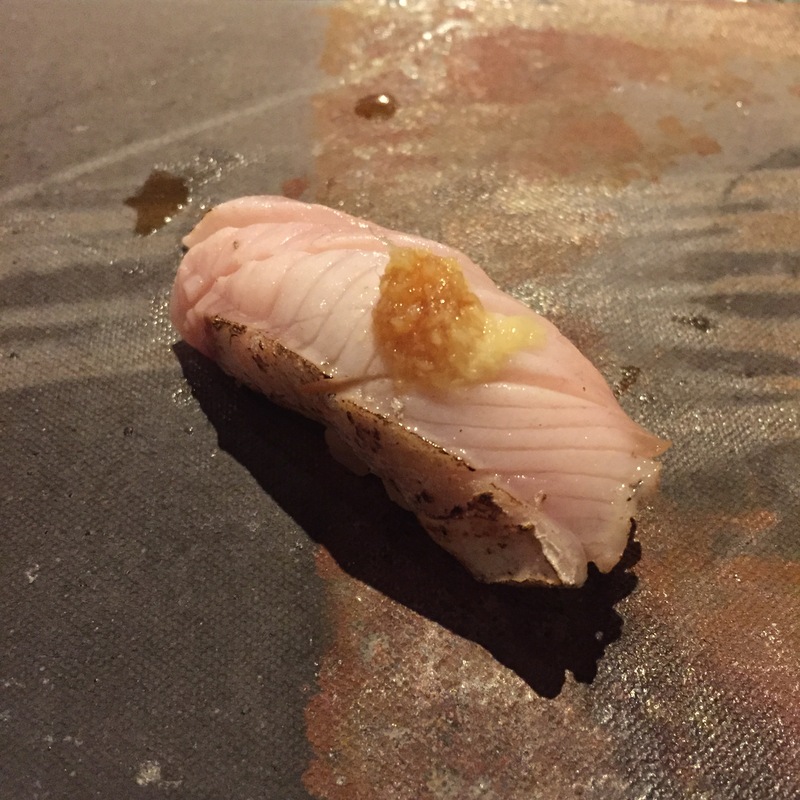 KINMEDAI (Golden eye snapper) – The skin could have used more ABURI-ing (torching), but otherwise, a great cut! 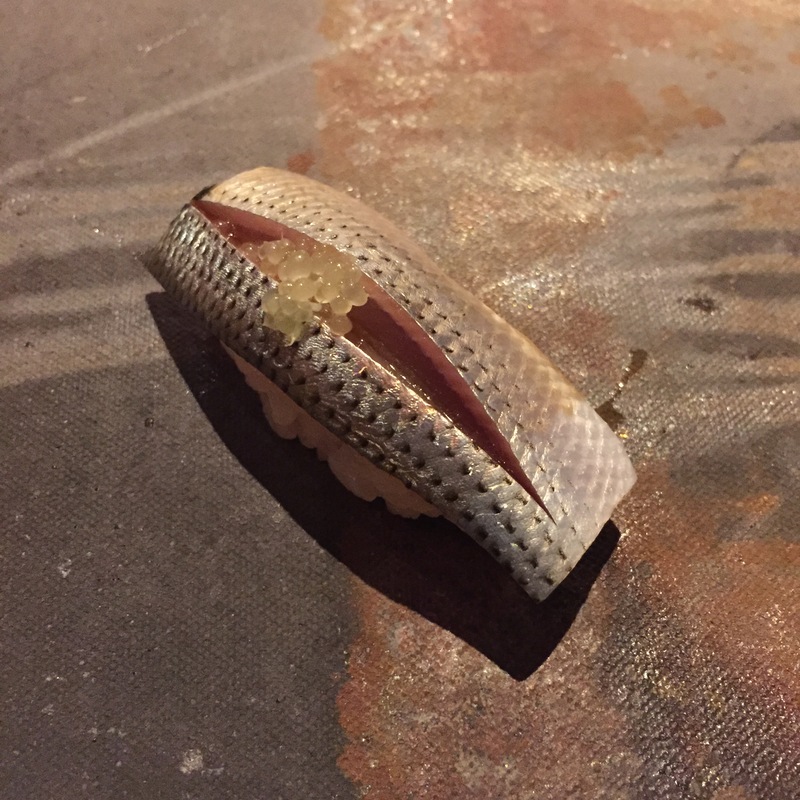 KAMASU (Barracuda) – The scored skin was slightly ABURIed, and topped with MOMIJI OROSHI. Same as the KINMEDAI, could have used more ABURI-ing. KAMASU only really shines when there is that bit of smokiness. I do like the MOMIJI OROSHI topping though. 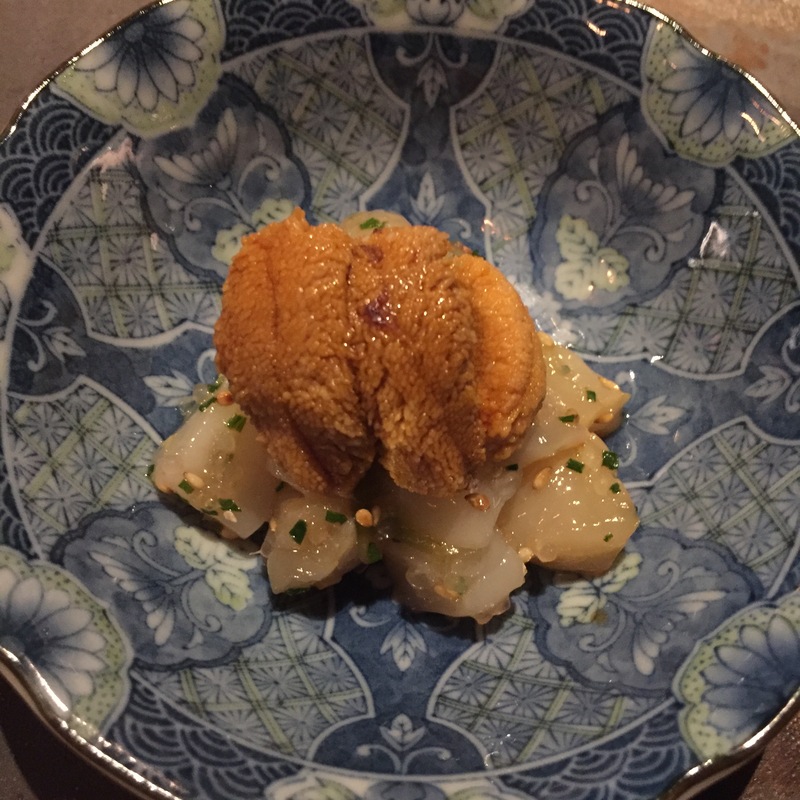 AKAMUTSU (Rosy sea perch) – Served with the skin ABURIed, and topped with grated ginger. AKAMUTSUs are super light tasting white fish, with TONS of flavor. ABURI-ing is unnecessary, and the ginger is an overkill. Completely overshadows the fish. AKAMUTSUs are best served plain, un-ABURIed, and with a little bit of citrus and either sea salt or soy. This one was a waste of a great fish. 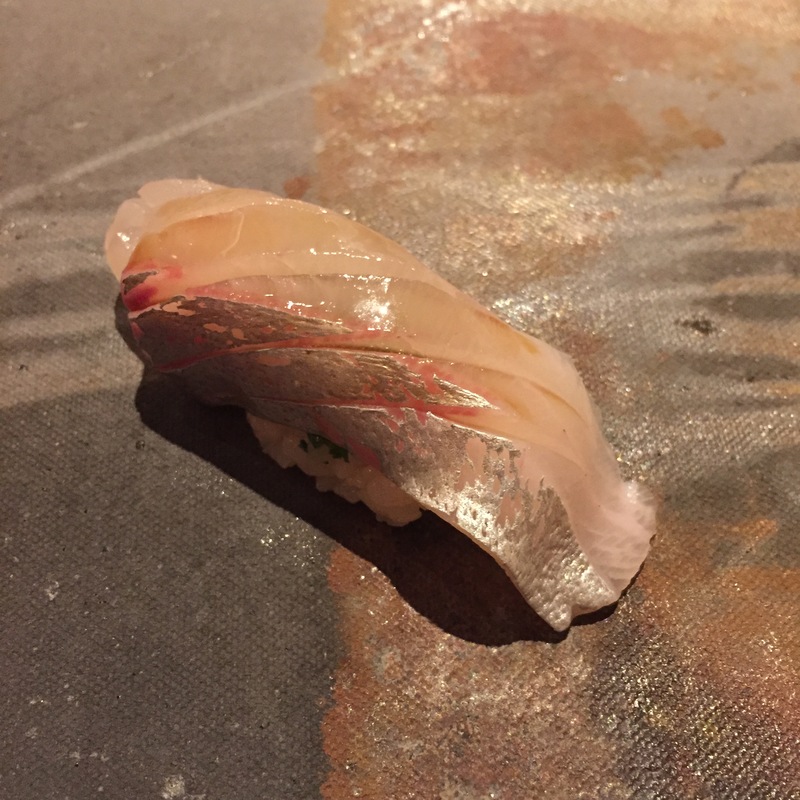 SABA (Mackerel from Boston) – I’m going to preface by saying, I’m generally not a fan of SABAs, so remember that as you read on. This thinly slice SABA was rolled up, and topped with sesame seeds, MOMIJI OROSHI, and soy, and placed back atop the sushi rice. I don’t really get it. None of it. Not the seeds, not the MOMIJI OROSHI, and definitely not the act of rolling it up. The flavors were all over the place, and not in a good way. 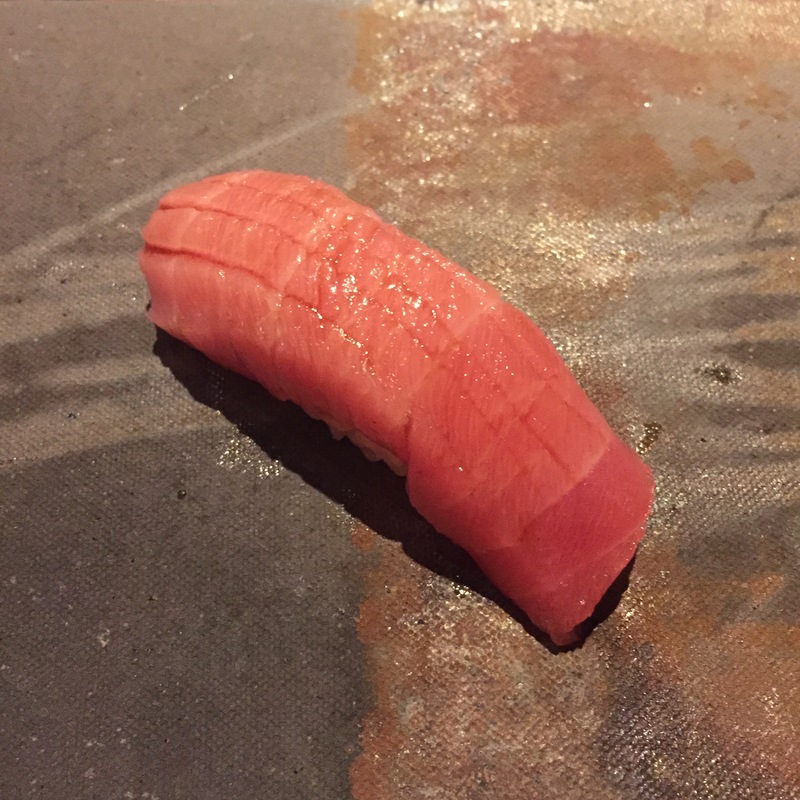 OTORO (super fatty tuna) – Just like the CHUTORO, this cut was fantastic, no veins, no funky aftertaste, complete melt in your mouth decadence. Thoroughly enjoyable. 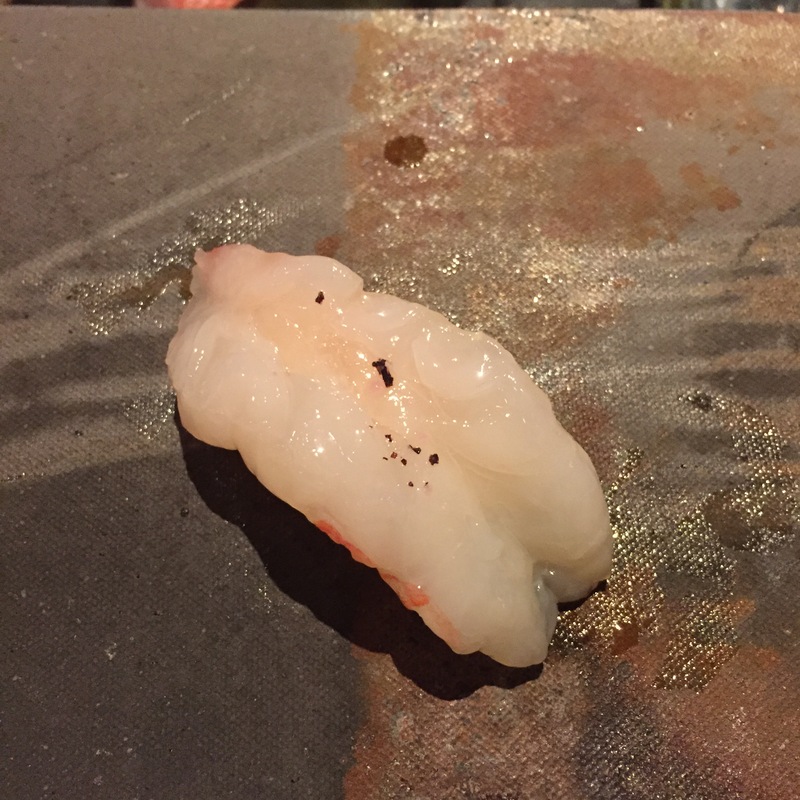 BOTAN EBI (Spotted sweet shrimp) – Perfectly good, perfectly tasty. Just sad that there’s still no frying of the head, Super interesting, Bae stated that BOTAN EBIs are going extinct. I said WHA???? How is that possible? 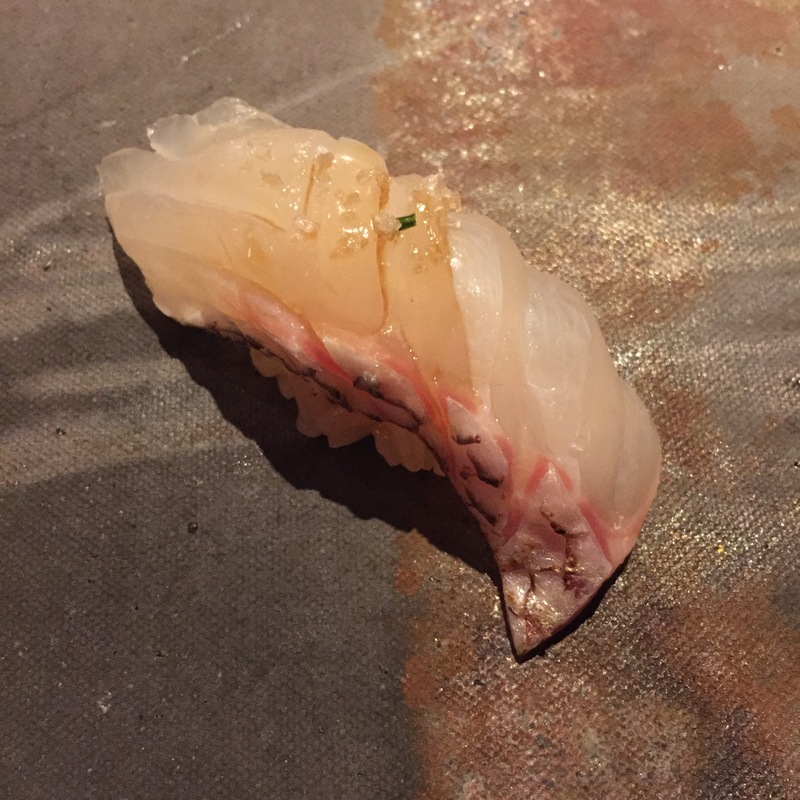 Are you referring to a particular BOTAN EBI from a specific region? Or BOTAN EBIs in general? She insisted it was in-general. I honestly didn’t know if she was pulling my leg… I ended up asking about 6 other chefs, and they had no idea what that’s about. FASCINATING. 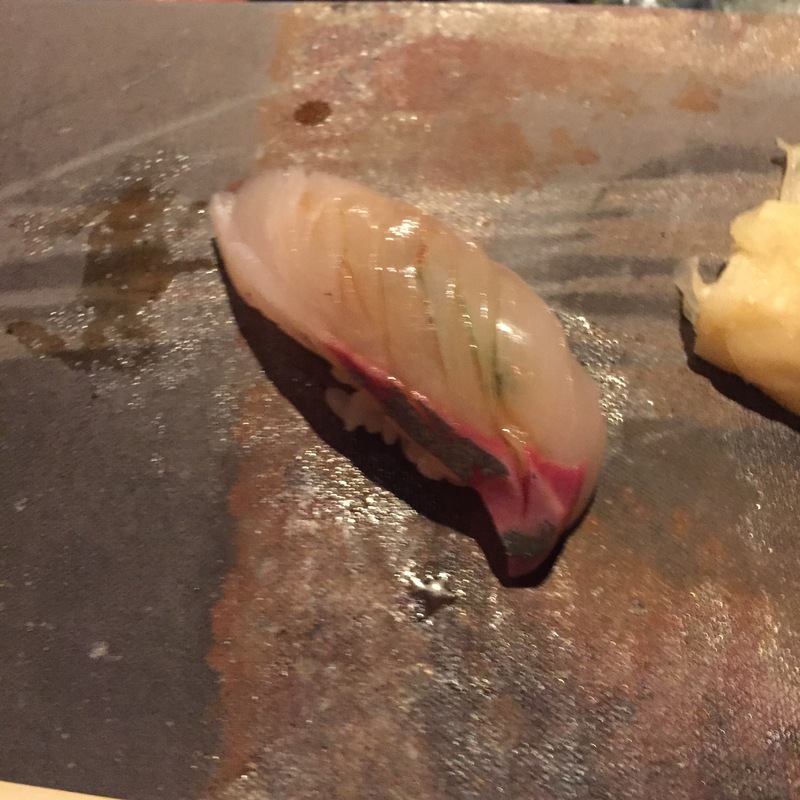 SAWARA (Spanish Mackerel) – Almost as confusing as the SABA. 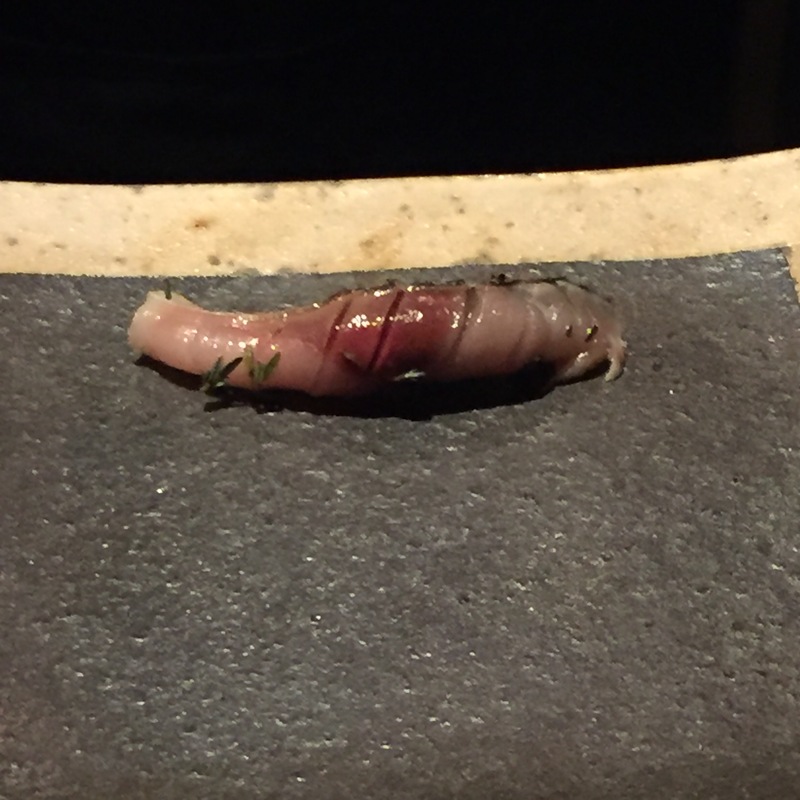 This was rolled up the long way, and topped with some unfamiliar herbs and soy. No idea what we are trying to accomplish here, but I would absolutely n ot order this one. 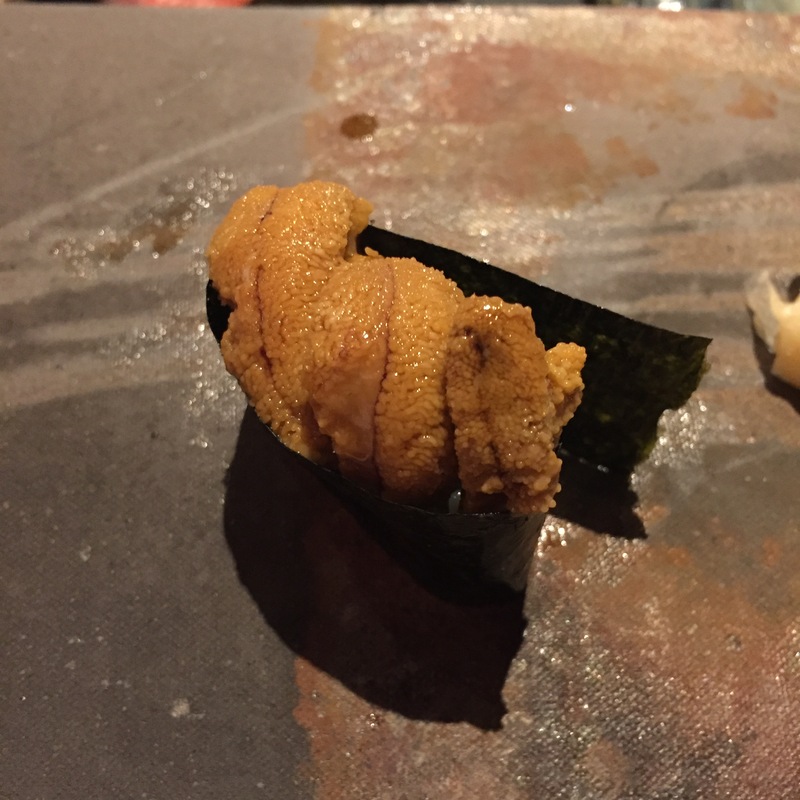 UNI from Hokkaido – This was fine, but nothing at all special. I’ve had much, much better Hokkaido UNI, especially lately. 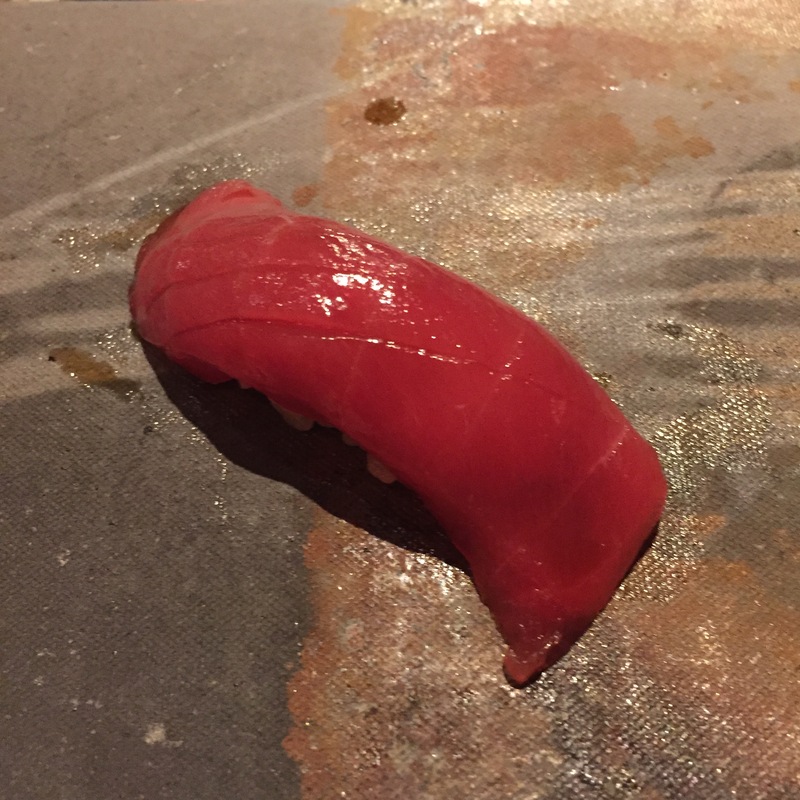 NEGITORO (chopped TORO with scallions) – EH… Besides it being 100% unexciting, the TORO wasn’t even all that fatty. Like I said, EH! 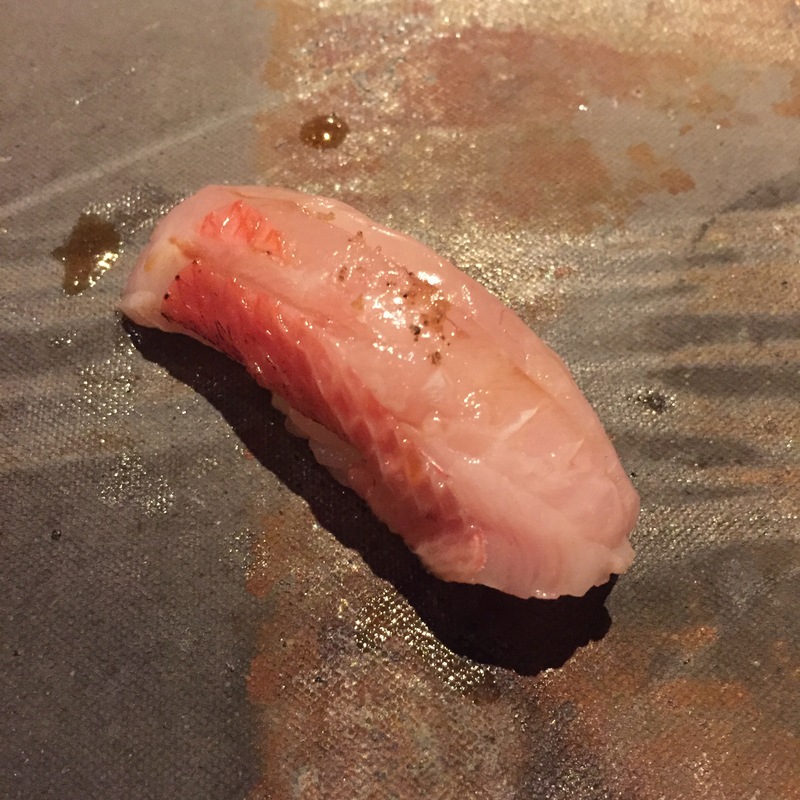 AKAMUTSU (Rosy sea perch) – The second time around was MUCH better. It was still unnecessarily ABURIed, but at least no funky ginger topping. 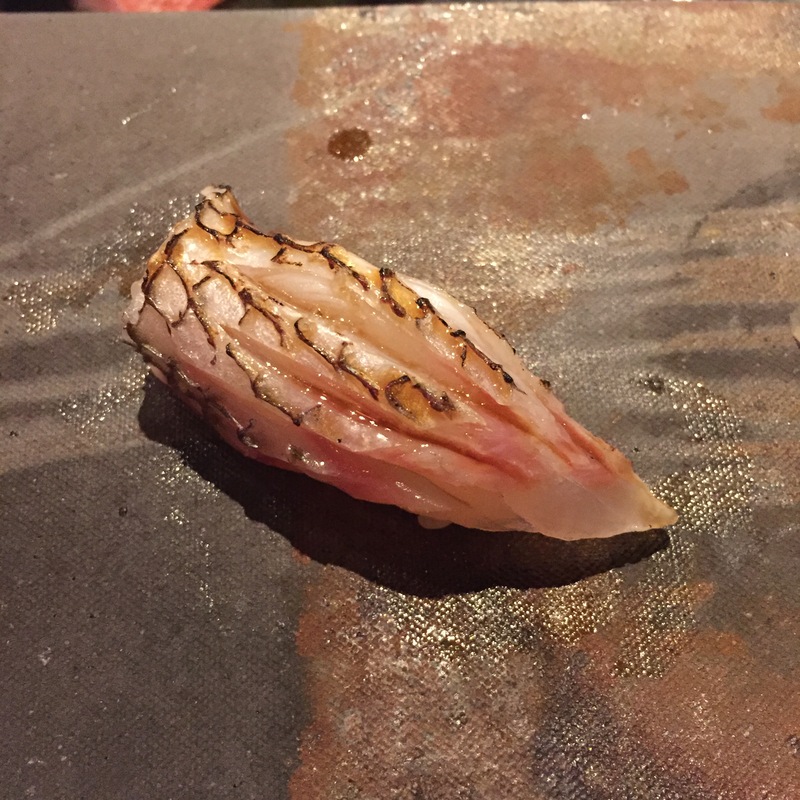 SHIMA AJI (Striped Jack) – Same as AKAMI, just as good as the last serving. Bae is definitely taking more risks with her servings. 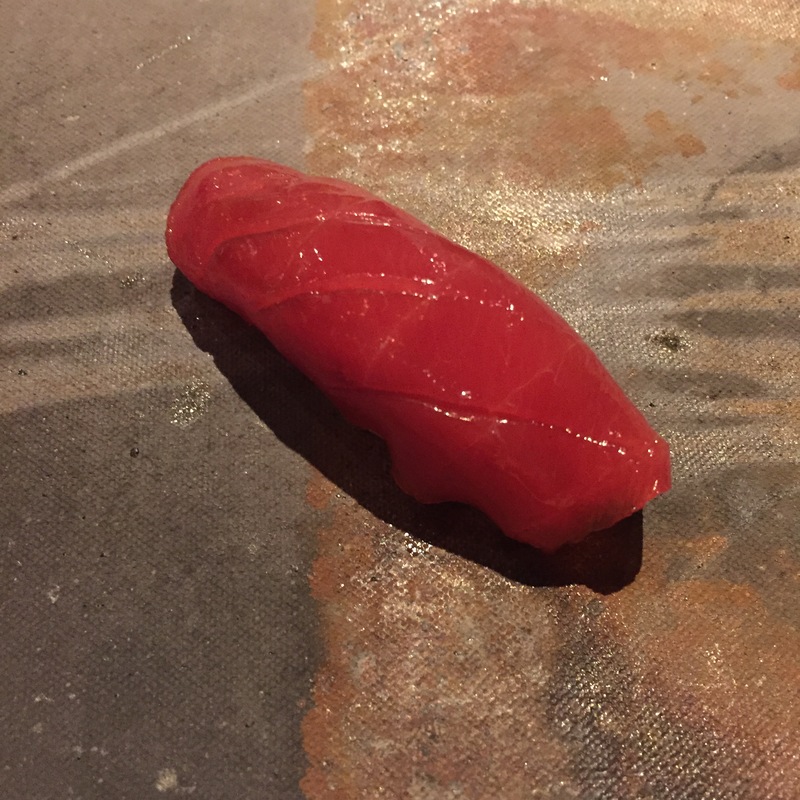 Some are tried and true traditional winners (MADAI KOBUJIME, her Tunas, her SHIMA AJI wonder), but the others fall short (HOTATE, SAYORI, IKURA bowl), or even fall flat on its face (AKAMUTSU with ginger, SABA, SAWARA). For the cost, it’s still a good deal, but the experience is definitely “lacking”.